Many people have found collections of buried coins, all over the world. Here in the UK, such finds have been dated as far back as Celtic times. Large quantities of coins discovered in a single or several pots are classed as ‘hoards’. They can be anything from a few dozen coins, to tens of thousands. It is more difficult to determine exactly what the smaller hoards are, and how they came to be buried there. Are they lost purses or a child’s secret stash? Had they just fallen out of a pocket or maybe, a soulful, almost votive deposit for a long forgotten personal reason? Whatever their story, they are certainly good for making the old mind wander into the realms of possibility. In most cases the mystery is resolved by the presence of a purse bar or decayed leather, or traces of fabric hinting at a similar container. Though even in cases clearly defined as ‘purse loss’, we are still left to ponder how the item got to be where we found it. I recently discovered my first small hoard at around ten inches down in an old meadow. There were no traces of a purse bar or fabric, and the terrain was quite damp. 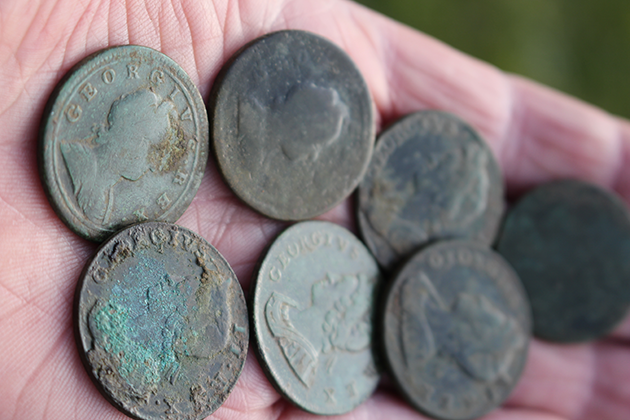 A few of the coins appeared to be nothing more than featureless discs – probably half pennies of George I, but they were too worn to decipher. 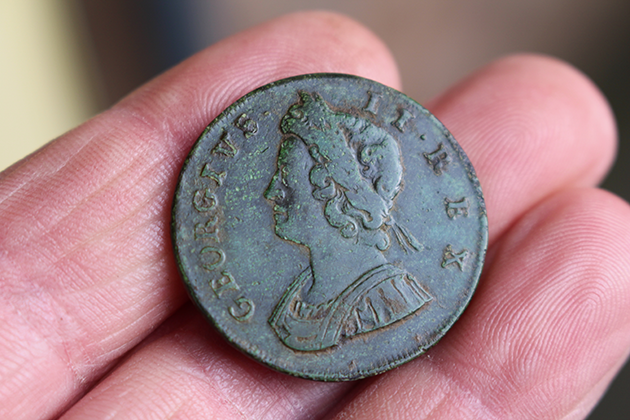 The identifiable finds were two Dump Issue Half Pennies of George I, and four Half Pennies of George XI. Some of these coins were in great condition, and we all know only too well what Georgian coppers are normally like. They were all found tightly clumped together in a cluster, along with a white clay pipe bowl. So what was this all about? Well of course I cannot say precisely. But I do believe that for some reason they were buried intentionally, and are therefore a small deliberate hoard as opposed to a loss. I state this because my detecting colleague recently found two more small deposits of coins just thirty feet or so from my own discovery. The first one consisted of six Half Pennies of William III. The other was a small hoard of five coins of George III, two of which (a Cartwheel Penny and a normal penny) had had their edges beaten with a hammer or similar object, raising them above the flan level. So within a few feet we have so far stumbled upon three small hoards. No doubt something curious was going on here. There was a Georgian Manor house near the site, and nearer still, a small cluster of surrounding cottages. In the absence of high security back then, perhaps the cottagers used the area as a bank of sorts – to keep small amounts of coins safe. Maybe the depositors sometimes passed away before collecting their money, forgetting or unable to tell their next of kin its location. Or maybe several people simply forgot where they had buried their coins. I would be very interested to hear from anyone who has experience of finding small hoards of copper coinage from the same period as these discoveries. Or indeed, anyone who has any theories as to what significance these small coin deposits may have. Julian is from Hertfordshire, England and has always been interested in fossils and antiquities. 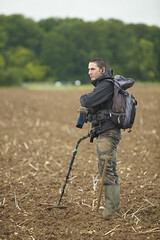 Julian has written a number of books on metal detecting, and is an avid user of Minelab products. Possibly a pocket loss or loses! It could have been an area where people would sit outside for picnic’s or even to court?